For special Q&A teaching sessions, youth group meetings, testimony time or prayer requests, there are so many different applications that Catchbox would be great for. 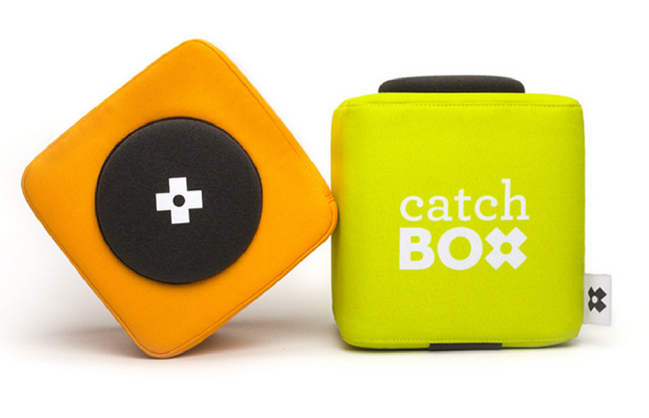 Simply put, Catchbox is a soft square with a built in microphone. Technically speaking, it’s a well developed, beautifully designed microphone that makes audience interaction a whole lot better. You can easily change the color of your cube by switching it out, it’s not heavy, and the microphone has been developed so it doesn’t make weird noises as it’s tossed around the room and handled. The price on the Catchbox is far from cheap, but I will say that it isn’t unreasonably priced. The first batch of 500 units being shipped this June can be pre-ordered for the discounted price of $549. Considering the price of a good microphone, replacing damaged mics that have been dropped while being passed around, and the uniqueness of the Catchbox, this could be a good investment for some churches, ministries and nonprofits. You can learn more and pre-order yours from the Catchbox website. As easily as they took the mic out to switch on, and then put in another shell, it looks like it would fall out while being tossed around. Other than that, this looks like an insanely good idea. Kudos to these guys for great innovation! I imagine that it’s designed in such a way that this doesn’t happen. Thanks for your feedback. The locking mechanism has been thoroughly tested and we have made sure that the capsule will not fall out from the cover part. This looks really cool but at the end of the video I had one HUGE red flag pop up, they never showed it working in action! They could have had the founders in a circle tossing it around during some part but that never happened it makes me super nervous as someone who has been very disappointed in the past backing projects. Also if you notice this is not on kickstarter or indiegogo there is not as much protection for you as a consumer. True story. Could be risky, or worth the wait for this to get in the wild. Great concept, none the less. When I was at the Evernote EC3 conference last September, they used CatchBox units in each of the breakout sessions. While it took a little to get people used to the idea of tossing it back and forth, the technology actually worked pretty flawlessly. It did add an element of fun to the Q&A part of each session. I used one of these at work last week. It performed flawlessly and my first thought was: “I need one of those for gathering prayer requests at our church!” There was no handling noise while throwing (the sound booth MAY have dealt with that). The clarity, volume, and feedback resistance were excellent. It made the meeting flow smoothly and added an element of fun! I’m a fan.